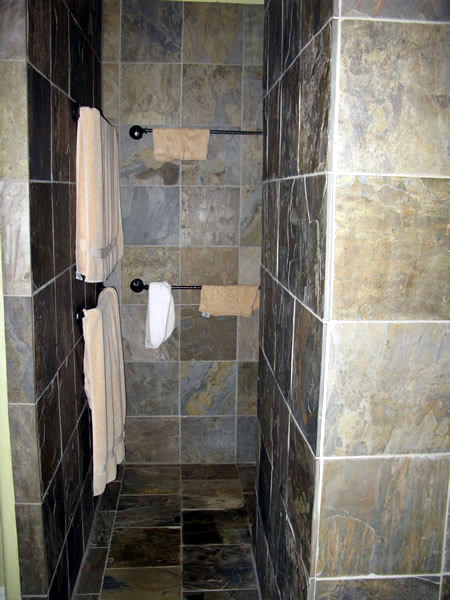 Your builder will have a plumbing fixtures supply company that he sends you to. This is where you get to pick out your sinks, bath tubs, shower enclosures, faucets, and other plumbing fixtures. There are many possibilities to inquire about. Let's cover some of them. You are going to need some plumbing outdoors. Think about your fence locations and where you are going to want water faucets. I'd like to recommend two often forgotten options. First, have at least one faucet by your back driveway that has both hot and cold water running to it. Get a faucet where you can mix the two sources like you would on a sink. This will give allow you to have hot, cold or warm water which can be very nice for car washing or hand washing in the cold of winter. I would actually have this faucet over cement so that you don't have to stand in wet grass while using it. You may want the same kind of setup on your side yard if you are planning on having a pool. This will give you the opportunity to have an outdoor shower. Any special plumbing for hot and cold water outside will need to have extra-long fixtures that can reach through the brick. 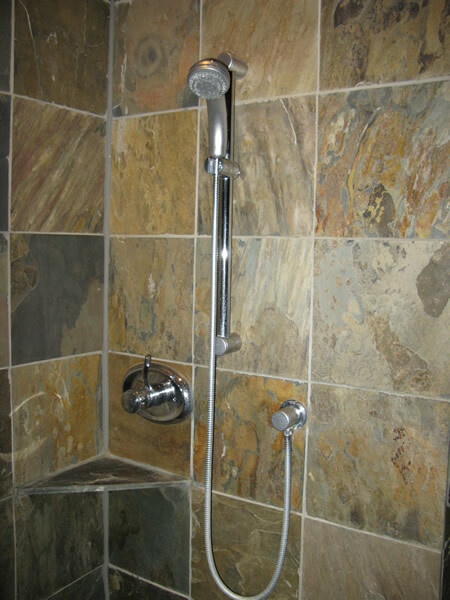 Most shower-type handles don't go through brick; they only go through bathroom tile. Make sure that the plumber or bricklayer takes this into account. For the rest of the yard, just make sure you have faucets on all sides of your house for when you need that occasional hose. We have a faucet that is actually on our back porch for watering plants and cleaning hands or feet while on the porch. My wife and I like using a gas barbecue grill. We have one built into our porch that uses natural gas. The plumbers need to get a line to it. I recommend having them install a keyed turn-off valve like you might have on your fireplace. This will allow you to hide the key from the kids. One item we blew was that we did not put a gas stub-out on our side courtyard. We have a small courtyard on the side of our house that is great for cooking out. We would have enjoyed using natural gas. Instead we have to convert our natural gas weber grill to one that uses propane. Why would we need two grills? For extra big parties. Plumbing for the garage? Yes! Consider a sink in your garage. It will be very handy for cleaning up. Also consider a refrigerator setup in case you will have one in the garage with an icemaker. Use a kitchen faucet with pullout handspray for hand washing clothes in the utility. Don't go cheap and get a tiny sink. Think about how you will use it and choose accordingly. Many people opt for a shower-like enclosure in the utility where they can hang up wet, dripping clothes or wash the dog with ease. If you plan to have a freezer in the Utility room, consider whether or not you will need a water supply now or in the future. Part of the plumbing in your utility is gas. I recommend setting up for both a gas and electric dryer. This way you will not be limited to one or the other in the future. Check out the Whirlpool Duet series of washer and dryer. They are full size, front loading, and stackable. We actually have a dryer on the left, a washer on the right, and another dryer stacked up on the washer. This requires some advance planning because you have to get several things right, including the cabinetry, electrical wiring, gas lines, and dryer ducts. If you plan on having two dryers, don't let them forget that you will need electrical, gas, and ducts for both. We used slidebars and handsprays in most of our tubs and showers. If you have never had a handspray in a shower, you don't know what you are missing. They are great for women when they shave their legs. In a tub, if you are bathing your preschooler, they are fantastic. They are also good for rinsing off the bath or shower when cleaning. Utility room near the washing machine. Bathroom under the whirlpool tub. Wet bar under the icemaker. I recommend using the Bradford White TTW2 gas water heater. We actually used two 50 gallon models. The specific model number was M-II-TW-50T6EN. We liked this model for several reasons. Its recovery rate for 90° F. rise is 70 gallons per hour. It is power vented and can be vented horizontally or vertically. It has an electronic ignition instead of a pilot light. It also has 2-inch non-CFC foam insulation. I located the water heaters over the garage so that if we ever had a leak, then it would ruin some sheetrock over the garage instead of over our hardwood floors. We also added a recirculation system for rapid delivery of hot water. This uses a pump to constantly circulate the water through the pipes. It gives you instant hot water at every location. Instead of a water heater supplying a particular area of the house, our water heaters are actually hooked up inline. This works well with the recirculation system. We installed a commercial water hammer arrestor to combat the vibration that occurs when you shut off a faucet. The design of our kitchen called for the Sub-Zero 601R refrigerator and 601F freezer. Neither has an icemaker or cold water dispenser. To compensate, we added an icemaker and water chiller to our wet bar. Our icemaker is the Kitchenaid KUIS185JSS. This 18" stainless steel icemaker can make 50 pounds of ice cubes every 24 hours and has a 35 pound capacity lighted storage bin. We installed a floor drain under the ice maker so that we did not need the model with a pump. For the water chiller, I chose the Elkay ERS1. It will cool 1.3 gallons per hour. Our wet bar sink has a one-handled cold water only faucet that is supplied by the water chiller. Our master bath is very nice. It has a walk-in shower with no door. There are three shower controls. 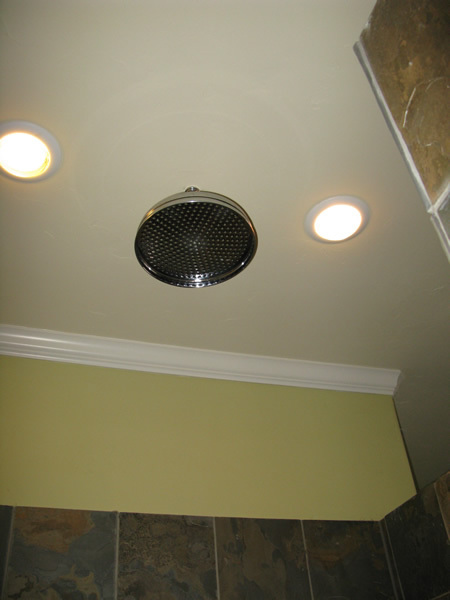 One is for an overhead rainfall shower head. The other two control handsprays on slidebars. Our bathtub is a Jacuzzi Gallery Corner model with a rapid inline heater. The whirlpool tub holds 74 gallons. The rapid inline heater allows you to fill the tub without completely draining your water heaters. It really doesn't heat cold water, it just maintains the temperature of the hot water you put in. It also doesn't last very long, maybe 15 minutes. If you want something that will last longer, then you better plan ahead. Discuss it with your plumber and the plumbing supply company. We chose to use two similar types of toilets. Both are made by Kohler and are called the San Raphael. The difference is that one version has a power flush. The power flush version needs a 120 volt GFCI outlet behind the toilet to power the flushing mechanism. It features a 2 1/8" glazed trapway to help prevent clogging. The non-powered version has a 2" glazed trapway. We have five toilets in our home. Three are the Power Lite (K-3398) versions, and two are the regular versions (K-3384). We used two without power because if the electricity is out in the home, you can still flush. Here's something funny I learned. The power flush toilets have a special button on them. The front part of the button is for flushing pee. It is a very short flush. The back part of the button is for flushing paper; it flushes a little longer. Didn't I say that delicately? What's funny about it? I didn't know that it mattered where you pushed on the button and for about 18 months, I couldn't figure out why it sometimes had a long flush and sometimes had a short flush. Doh!! !